We usually meet on Fridays from 3:30 to 5, but feel free to arrive late or leave early as your schedule permits. While we encourage everyone to participate in the conversation, you are more than welcome to simply hang out and listen! Many of our events discuss a pre-circulated paper, but don't be afraid to turn up even if you haven't had a chance to read it. When available, links to download the paper should be clearly visible beneath the abstract. This meeting has been postponed until Fall 2018! London is famed both as the ancient center of a former empire and as a modern metropolis of bewildering complexity and diversity. In Indigenous London, historian Coll Thrush offers an imaginative vision of the city’s past crafted from an almost entirely new perspective: that of Indigenous children, women, and men who traveled there, willingly or otherwise, from territories that became Canada, New Zealand, Australia, and the United States, beginning in the sixteenth century. They included captives and diplomats, missionaries and shamans, poets and performers. Some, like the Powhatan noblewoman Pocahontas, are familiar; others, like an Odawa boy held as a prisoner of war, have almost been lost to history. 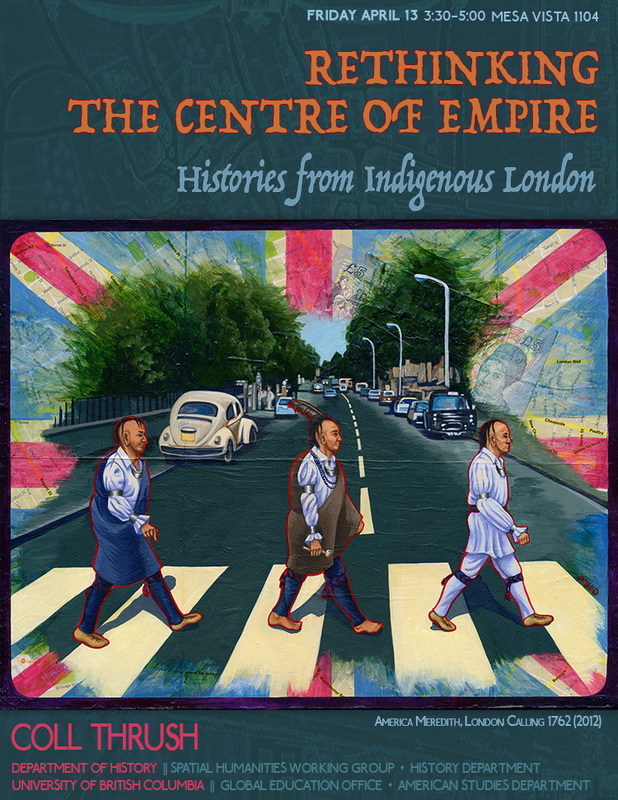 By focusing on the city’s imperial entanglements with Indigenous history – entanglements of knowledge, disorder, reason, ritual, discipline, and memory – Thrush shows how London learned to be a global city and how Indigenous people and peoples were central to that process. 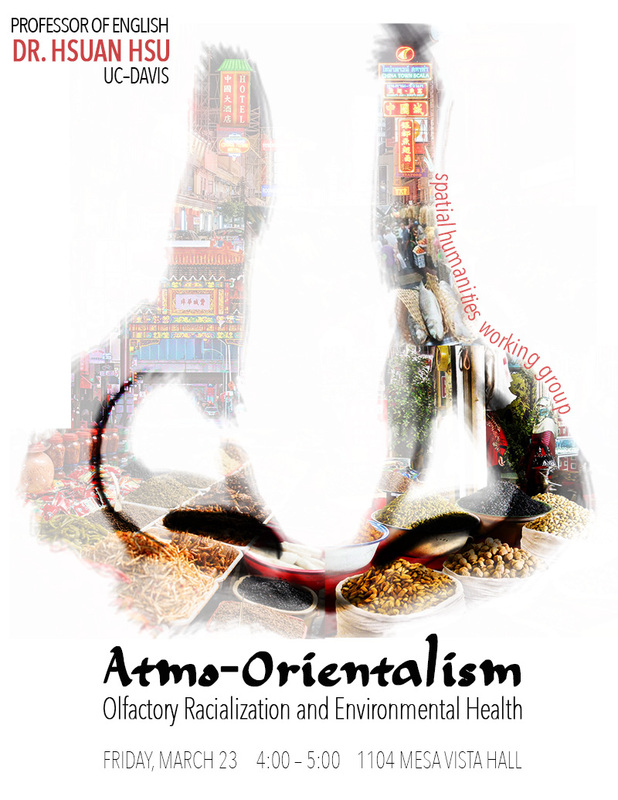 “Atmo-Orientalism: Race, Atmosphere, and Environmental Health” considers the process of “environmental exclusion” that comes hand-in-hand with deodorization by constructing a genealogy of discourses that racialize Chinese spaces as atmospheric health threats. Reading a range of legal and cultural discourses conflating the Chinese with bad air, this paper argues that representations of the Chinese as diseased and toxic manifest in the (apparently “race-blind”) form of atmospheric difference. The paper concludes by considering how Asian diasporic texts–from Sui Sin Far’s Mrs. Spring Fragrance (1912) to the work of contemporary olfactory artist and Anicka Yi (who sampled scents from Manhattan’s Koreatown and Chinatown in Life is Cheap (2017)—respond to atmo-orientalism by underscoring how noxious air is sustained by air conditioning at both urban and transnational scales. Climate change is often framed in scientific terms. However, it is as much a cultural and social issue as it is a scientific issue. Multiple narratives of climate change exist: for example, some see it as an existential and apocalyptic threat to life on earth or a national security issue; others see it as a social and environmental justice issue and a crisis of capitalism; others see it as a hoax and a ‘Trojan Horse’ for unnecessary regulations. In the summer of 2017, I was invited to take part in an Art + Science Climate Communication residency at Playa in Oregon. While there, I began a new series of poems that creatively-critically explore and respond to the multiple narratives of climate change. Specifically, each poem takes as its title a quote on climate change. The quotes/titles represent a variety of voices on the issue, from scientific to literary to social theoretical to spiritual to political. The resulting poems have taken a variety of tones, from matter-of-fact, to hopeful, to outraged, to despairing, to sarcastic/satirical, to combative, to lyric meditation. The form of this climate geopoetics project allows me to merge my (geo)poetic practice with my human geography research on environmental and climate narratives. I intend to turn this work into a book that combines the poems with an extended critical essay on climate narratives. On March 1, I will share some of the early poems from this project and some ideas for the shape that the book will take. I look forward to feedback. The PDF linked to below includes four of the early poems from the project. As “Climate Geopoetics” builds on my ongoing research/creative practice related to climate change, I am also including in the pdf some background: a few recent book contributions/articles. The first is my contribution to the book Big Energy Poets: Ecopoetry Things Climate Change (Staples & King, eds. BlazeVOX, 2017). Following that are two articles that are currently in press: “Healing, belonging, resistance, and mutual care: Reading Indigenous ecopoetics and climate narratives”, forthcoming in the journal Literary Geographies, and “Applying the Geohumanities”, forthcoming in the journal International Journal of Applied Geospatial Research. If you don’t have time to make it through everything, please focus on the four short poems and the “Applying the Geohumanities” article (the last one of the PDF). The discipline of geography has long been practiced in an edge zone/ecotone between the physical sciences and the social sciences. In recent years, geography has also taken up a renewed engagement with humanities approaches that apply creative and artistic practice to geographic research. As a geographer and a poet, this is largely where my practice has been situated. I will share two examples from my recent work: The Sonoran Desert: A Literary Field Guide, a 2016 book that blends the genres of field guide and literary anthology; and BYCATCH, a co-produced art-science project that examines the shrimp trawling fishery in the Gulf of California that has resulted in art installations as well as other outputs. 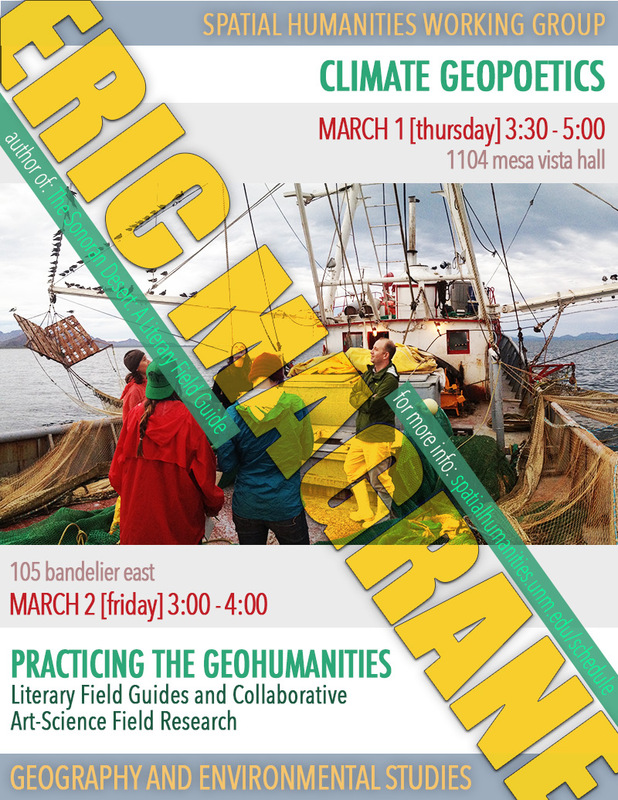 Drawing on these examples, I’ll reflect on some of the possibilities of practicing the geohumanities as a transdisciplinary art-science endeavor. On December 22, 2017, President Trump signed the GOP Tax Bill, which authorizes oil and gas exploration and development in the coastal plain of the Arctic National Wildlife Refuge, a biological nursery of global significance and a place the indigenous Gwich’in people of northeast Alaska and northwest Canada call, “The Sacred Place Where Life Begins”. For millennia, the Gwich’in, who call themselves “the caribou people”, have relied upon the Porcupine River caribou herd for nutritional, cultural and spiritual sustenance. Oil drilling in the caribou calving and nursing grounds in the Arctic Refuge coastal plain would be a violation of Gwich’in human rights and will endanger their food security. On Friday, February 2, I plan to share some of the ideas for a short essay I’m just starting to work on, which will appear in a special issue Beyond the Extractive View in Social Text Periscope Dossier. 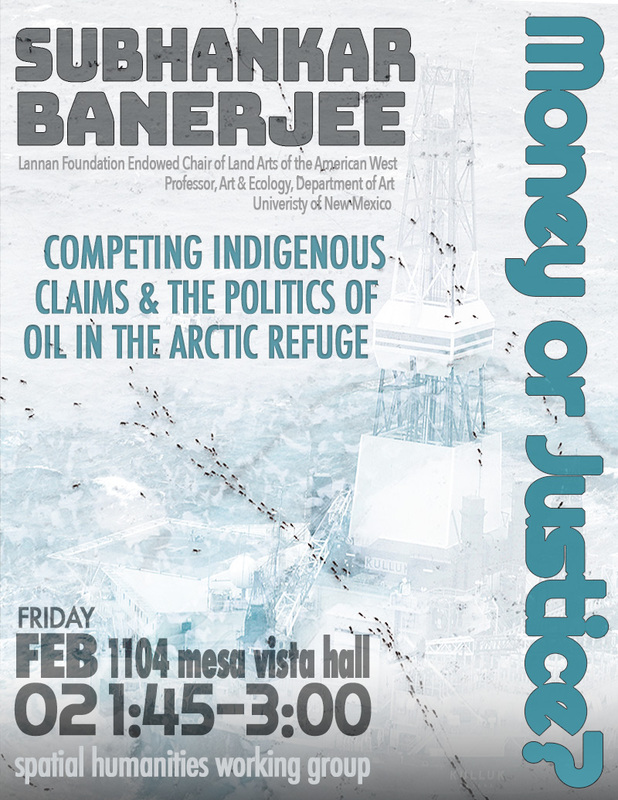 In the piece, I plan to explore two competing claims: (1) the human rights argument of the Gwich’in Nation (as discussed in the “Long Environmentalism” chapter); and, (2) an argument to make money from oil drilling by the “Voice of the Arctic Iñupiat”, a corporate-funded pro-oil advocacy organization, which was publicly visible for the first time during a Senate committee hearing on November 2, 2017. Spatial humanities could shed light on this rather unique situation and I’m hoping to get feedback from you all. On a related but separate note, I’m convening “The last oil—a multispecies symposium on Arctic Alaska and beyond”, which will take place on the UNM Main Campus from February 21 through February 23.